Understanding who God is… will draw you to a closer walk with Him. Ok I’m not going to be theological with my answer here at all. It’s just not me. My answer is from my own mind and I say…Nobody created or made God. What is my personal proof? 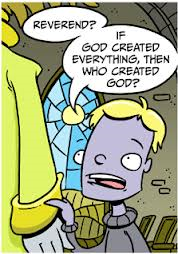 None…I believe it’s just not logical to think that God was created. I also believe the question… “who created the creator?” will aways be the never-ending question. Not really convincing huh? I know. I know when I was a little girl I would about go crazy with this question. Now that I am 50 years old I have understanding that He is the I Am that I Am, He is the Alpha and the Omega, the Beginning and the End! Some things we simply cannot fit into our minds. Somethings we aren’t meant to understand which is part of learning to simply trust Him and have faith. In Isaiah 55 the Lord says for His ways are higher than ours and His thoughts higher than ours. That is all we need to know for now. Maybe when we stand before Him we will understand more, or will we? I am thinking when we stand before Him all of these questions will NOT even be of concern to us. His majestic Glory will be all we see. Cannot wait! Oh I can’t wait to see Him and bow down to worship Him. I just can’t wait too!!! God bless you!! !